Grease a 19cm Spring form pan (or mini-cheesecake pans with loose bases for individual serves) with extra virgin olive oil and line the base with baking paper. Place the muesli in a large ziploc bag and use a rolling pin to crush until it resembles breadcrumbs. Transfer to a bowl and add the ground hazelnuts and the extra virgin olive oil. Mix well to combine and press the mixture firmly into the bottom of the prepared pan with the back of a spoon. Soak the gelatine sheets in cold water for 5-7 minutes. Squeeze out excess water and then melt the sheets in a small pan over a low heat. In a bowl, combine the ricotta, honey and lemon juice. Pour in the liquid gelatine and beat the mixture with a spoon to combine well. Pour into the pan over the crumb base and spread out evenly. Refrigerate overnight to set. Defrost the frozen raspberries in the microwave for 30 seconds. Puree with a stick blender. Gently remove the cheesecake from the pan and place onto your serving plate. 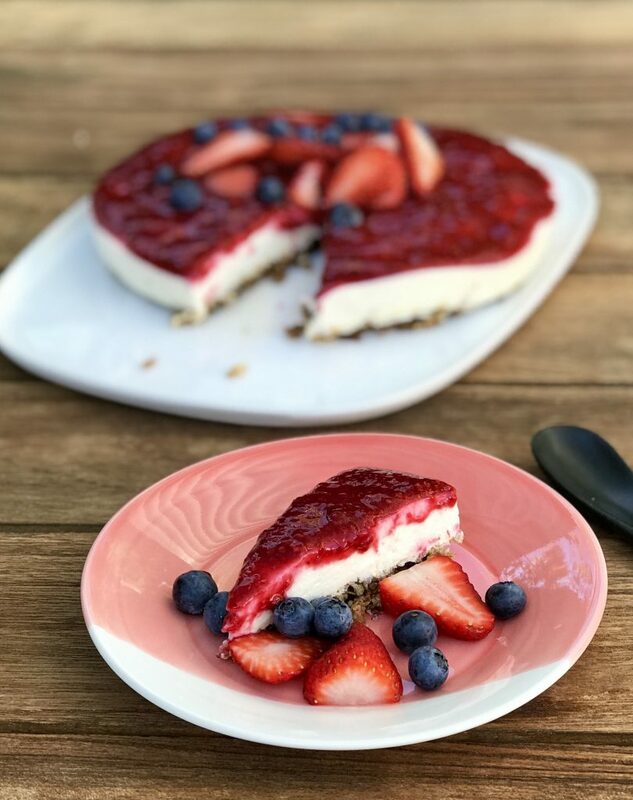 Spread the top with the raspberry puree and garnish with the fresh strawberries and blueberries.